For some people, reading is more than just a hobby—it’s an integral part of their daily life. If you’re a confirmed bibliophile, your dream job would be one that surrounded you with books day in and day out. And this is especially true if you’re one of many who are wondering: What on earth can I do with my English literature degree? Fret not, bookworms. At Writer’s Relief, we know you have options! Whether you are looking to parlay your love of reading into a side gig or are hoping to launch a full-time career in an industry that will let you read 24/7—a little bit of ingenuity may help you land a bookgeek-friendly job. 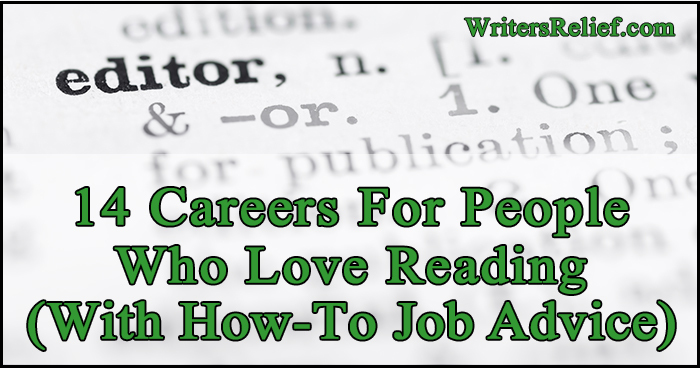 Check Out This List Of 14 Jobs And Careers For People Who Love Reading Books! Proofreader. If you love reading, you might love proofreading! Proofreaders must combine extraordinary attention to detail with an expert understanding of the rules of writing. They work everywhere: blogs, publishing houses, magazines, schools, marketing firms, and more. If there are words involved, there are probably proofreaders waiting in the wings! Often, proofreaders are contract employees who can make their own hours and set their own pay rate. Copyeditor. While proofreaders have proficiency in grammar rules, copyeditors are experts in the particular style of a given publisher. In other words, a copy editor is a specialized proofreader. If your idea of the perfect job is to work for a publisher and read books all day to correct for formatting, style, and grammar, then you might enjoy a career as a copyeditor. Acquisitions editor. If the word editor conjures up images of reading an undiscovered writer’s manuscript late into the night, then bursting into an editorial meeting the next morning declaring that you’ve found the next best seller, you are thinking of the quintessential “editor” job at a publishing house. Acquisition editors discover new books and then see them through to publication. It’s a book reader’s dream job! Literary agent. Literary agents are the gatekeepers to the traditional publishing industry; they spend lots of time reading query letters and unpublished manuscripts in order to find great new books. But good literary agents love nurturing relationships just as much as they love reading new books. Agents must get to know editors across many different publishing houses in order to connect writers with publishers. Literary agents also negotiate contracts, and so must have plenty of friendly assertiveness and legal know-how. If your dream job involves both lots of reading and lots of schmoozing, you might be ready for a career as a literary agent. Book scout. Book scouts read books for a living. Seriously. Book scouts work for publishers or literary/film rights agencies to identify properties (books) that could yield film contracts or foreign rights (translations) deals. Some book scouts even work directly for movie producers who hope to nab the rights to the next Oscar-winning film. Book scouts must maintain friendly relationships with literary agencies in order to spot the next big thing well before it hits the shelves. Freelance content editor. Writers who work for themselves offering manuscript critique services are sought after for their experience as editors. Often, a reputation within the publishing industry is necessary to establish editorial expertise as a freelance content editor. Freelance content editors get to spend lots of time reading, and they also have the satisfaction of seeing their advice improve other people’s writing craft. Book reviewer. You can get paid for your opinion about books when you become a book reviewer. Although you may or may not be able to parlay your book reviews into a full-time job, you might still be able to earn a little extra money doing something you love anyway (reading books!). Plus, authors/publishers seeking reviews often give out free books to reviewers (Woohoo! Free books!). Academic/professor/researcher. If you love reading and researching—and talking about your reading and researching—then you just may have a future in the world of academia. It may require an advanced degree to earn a coveted spot in your research field of choice, but the rewards can include a stable career (with a retirement plan and health care). Librarian. If you love reading so much that simply being around books is enough to make you sigh with happiness, you might enjoy a career as a librarian. There are many different types of librarians who have different sorts of expertise. But most careers in library sciences start with an investment in higher education. Lawyer. You may be surprised to find “lawyer” on our list of careers for people who like reading, but the fact is lawyers must read a lot. Really—a lot. If the idea of spending hours upon hours going through court cases and legal documents is your idea of a good time, you might look into becoming an attorney. Lawyers must also do a lot of strategic writing. So a career in law may be the best of both worlds. Translator. Translators may be most visible on television documentaries and at global government summits, but much of their work is done on paper or online. Becoming a translator may be a great choice for someone who loves reading and language. Audiobook narrator. Combine your talent for acting with your love of reading to earn some extra income working as an audiobook narrator. Archivist. If the idea of spending hours scouring through dusty books and crumbling manuscripts brings a smile to your face, you have the heart of an archivist. Archivists work in libraries, hospitals, museums, universities, and more. Excellent organizational skills are a must! Bookseller. Love talking to others about books almost as much as you love reading them? Why not open your own bookstore? To the joy of many, the popularity of independent bookstores has seen a marked rise in recent years. There’s a commonly held belief that booklovers probably won’t make a lot of money in their chosen career, but we think that old myth has no place in the modern world. Thanks in part to the Internet, the business of the written word is thriving. And if you have a canny career sense and lots of passion for reading, chances are you will be able to get a job that will satisfy your love of books and reading. Question: Which of these careers is your dream job?